Fiat has a tradition of producing small vehicles that are fun, stylish, and economical. If you’re in the market for a compact crossover, definitely take a look at the 2019 Fiat 500X. You’ll enjoy the Fiat 500X’s nimble road manners and versatile interior design. This year, you’ll be rewarded with an even more fulfilling list of standard features. However, prices for the base model have increased quite a bit. To help improve performance, Fiat has equipped the 500X with a more powerful engine and standard all-wheel drive. Updated exterior styling also highlights the 2019 Fiat 500X. Last year’s Lounge trim was discontinued. Last year, some drivers found the 500X to be a bit lacking in the performance department. To solve this issue, Fiat has updated the crossover with a new engine. Direct injection helps the 1.3-liter, turbocharged four-cylinder engine to develop 177 horsepower and 210 pound-feet of torque. The extra torque helps the 2019 Fiat 500X to feel much stronger around town. When merging onto a busy freeway, you’ll also appreciate the extra muscle under the hood. No longer do 500X buyers have to pay extra for all-wheel drive. Every trim in the lineup now sends power to all four wheels. This is an especially big deal for the drivers who tend to experience rough winters. 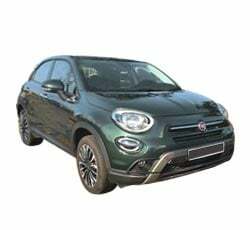 Although the 2019 Fiat 500X is not great for off-roading, it will perform well in the snow. Ground clearance is a decent 7.9 inches. Fortunately, the AWD system doesn’t cause a drop in fuel economy. There are plenty of drivers who’ll like the 500X’s Italian styling. Its new front fascia is the biggest highlight for 2019. A revised grille helps give the SUV a more refined appearance. While LED taillights come standard, LED headlights are available as an option. Fiat has also updated the base Pop trim by installing a more attractive set of 17-inch alloy wheels. If you desire a more adventurous look, expect the Trekking trim to catch your eye. Three new paint colors have arrived: Italia Blue, Vibrante Green and Milano Ivory. When driving the new 2019 Fiat 500X, look forward to enjoying a relaxing ride. It has some of the most comfortable seats in the segment. This is a key advantage for the drivers who’ll be spending a lot of time commuting. Very few SUVs in the segment come standard with a height-adjustable front passenger seat. Despite being designed to accommodate urban dwellers, the Fiat 500X can certainly handle the task of taking you on an out-of-town trip. If you’re not looking to spend more than $25,000 on a new vehicle, the 500X’s base Pop trim will leave you satisfied. It has an attractive MSRP of $24,490. You won’t be missing out on any features. Technology lovers will especially appreciate the standard Uconnect touch screen, which is among the best in any price class. A six-speaker sound system, remote start and dual USB ports come standard as well. Furthermore, all-wheel drive is no longer an extra cost. Over the years, Chrysler/Fiat’s Uconnect infotainment system has consistently ranked among the best interfaces on the market. The latest generation of Uconnect is better than ever. You’ll love the 7.0-inch touch screen’s clear graphics and quick response. After linking your smartphone to the system, it’ll only take a few seconds for your mobile apps to load. Most importantly, Uconnect is painless to use. Even first timers will quickly learn how to use the system. GPS navigation is offered as a standalone option. Fiat didn’t forget about the 500X’s interior. It now has a more quality feel. The new premium cloth upholstery makes the entire cabin look more upscale. Drivers will appreciate the SUV’s new steering wheel with radio controls, which now allows you to obtain a more comfortable grip. Meanwhile, improved graphics make the driver information display easier to read while on the road. Although the base Pop trim will satisfy most people, upper trims give you access to premium materials like leather upholstery. The typical music fan will not have any big complaints about the 500X’s standard stereo system. Nevertheless, you’ll have a lot more fun jamming to the high-definition Beats Audio system. It allows drivers to truly rock out on an everyday basis. Along with the system comes a 506-watt amplifier, which pumps power to a total of nine speakers. A subwoofer enables the system to produce distortion-free bass. Expect to experience a far more entertaining commute to work or school. When driving the 2019 Fiat 500X, you can lean upon its valuable safety technologies. A ParkView backup camera comes standard across the lineup. Upper trims can be equipped with an Advanced Safety package. While blind-spot monitoring uncovers unseen vehicles on the highway, forward collision warning system with automatic braking activates when approaching unexpected obstacles. You’ll also benefit from the lane-keep assist system, which helps prevent you from drifting into the next lane. Meanwhile, rear parking sensors help guide you into snug spaces. Although the 2019 Fiat 500X may not be a high-performance vehicle, it’s still quite entertaining to drive. Punchy acceleration and nimble handling make it perfect for maneuvering around the city. Even during bad weather, the standard AWD system will inspire confidence. Unfortunately, you’ll have to shell out more money for a 2019 Fiat 500X. The previous 500X had a starting price of only $19,995, which is roughly $4,500 dollars less than the current model. This increase in cost is mainly a result of the SUV’s standard all-wheel-drive system and new engine. If you desire a front-wheel-drive SUV that costs less than $20,000, take a look at the 2019 Jeep Renegade and the 2019 Nissan Kicks. Like so many other new vehicles, the 2019 Fiat 500X no longer offers a traditional manual transmission. This fact will likely sadden the drivers who find automatic transmissions to be less exciting. Every new 500X now comes equipped with a nine-speed automatic gearbox. Similarly sized crossovers that continue to offer a stick shift include the 2019 Kia Soul and the Subaru Crosstrek. There’s no overlooking the 500X’s compact design. While children will have no issues with SUV’s backseat, teens and adults will likely desire more space for their legs. This is especially true when sitting behind a tall person. You also must sacrifice some cargo space. Before you make a final decision on the new 500X, be sure it will comfortably accommodate your family and friends. The 500X’s standard AWD system is a big plus. You’ll find this crossover to be a great traveling companion during the winter time. However, don’t expect the 2019 Fiat 500X to confidently handle rough terrain. It does not offer undercarriage protection or an off-road suspension. Serious adventure seekers should check out the Jeep Renegade Trailhawk, which benefits from a more rugged 4WD system and a terrain management system. Many automotive critics consider the 2019 Mazda CX-3 to be one of the sportiest crossovers in the segment. While the CX-3 is definitely fun to drive, the 500X comes equipped with a more powerful base engine. You can also take advantage of the 500X’s standard all-wheel-drive system. The Honda HR-V ranks among the class leaders in several categories. However, some drivers will find its engine to be a bit underpowered. Quicker acceleration gives the new 500X a key advantage. You may also be considering the new Toyota CH-R, which has a high predicted reliability rating. Unfortunately, this crossover doesn’t even offer all-wheel drive. Although Toyota’s Entune infotainment system has improved, it’s still a notch below Fiat’s excellent Uconnect interface. The 2019 Fiat 500X has improved in two critical categories: comfort and performance. While a more potent engine makes the 500X more enjoyable to drive, interior tweaks have transformed it into a more relaxing daily-driver. Furthermore, you can enjoy the enhanced traction of all-wheel drive without getting penalized with poor fuel economy. Italian styling also makes this pint-sized crossover easy on the eyes.